Sorry, this workshop has sold out. Learn to cut, texture and form sheet metal, using copper, brass and sterling silver to create simple but beautiful effects. 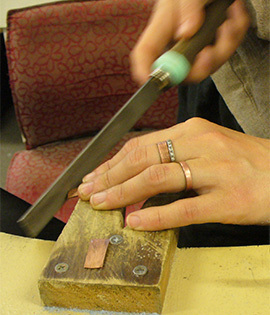 Make either a ring band or a simple pendant that can be hung on cord, using the easy techniques of hammer texturing or roll-printing onto copper, brass and sterling silver.